How to turn Numlock on or off on a Laptop: Many Laptops including the HP Envy 17, do not feature a Numlock key. I found this out when my HP Envy 17 Numpad quit working after using an external keyboard. In the following simple solution, I’ll show you one very easy way to Turn Num Lock On or Off, on the fly. 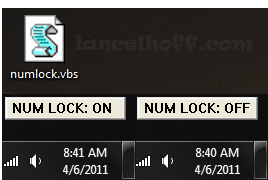 Double click the numlock script to turn Numlock On. Double click the numlock script again to turn Numlock Off.